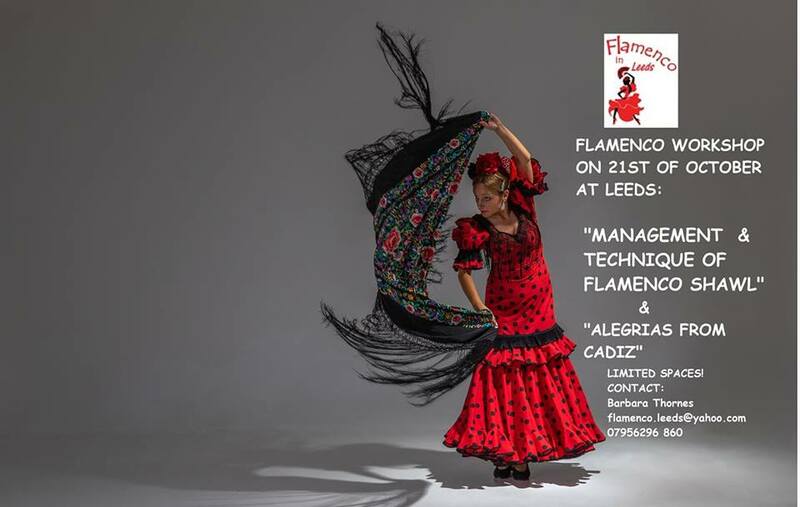 Enjoy the Spanish flamenco experience in LEEDS!!!! Get ready to explore the Flamenco Roots and it’s amazing art. I will introduce you to the world of flamenco dancing with Spanish Fan, you will learn “Guajiras”, its timings, movements and expression of the whole body. We will work together the Spanish fan language- technique and a choreography to dance “Guajiras”. The Guajiras has grown out of the travels of Spain working people who went to New World to work an returned to Spain, bringing traces of of the Culture of the Eastern Cuba with them, the resulting form is a beutiful, elegant, graceful tropical flamenco rhythm. Please don’t miss out. There are LIMITED SPACES, please make sure you book now and don't miss out! * IMPORTANT: Please bring a Spanish fan , water and a smile! 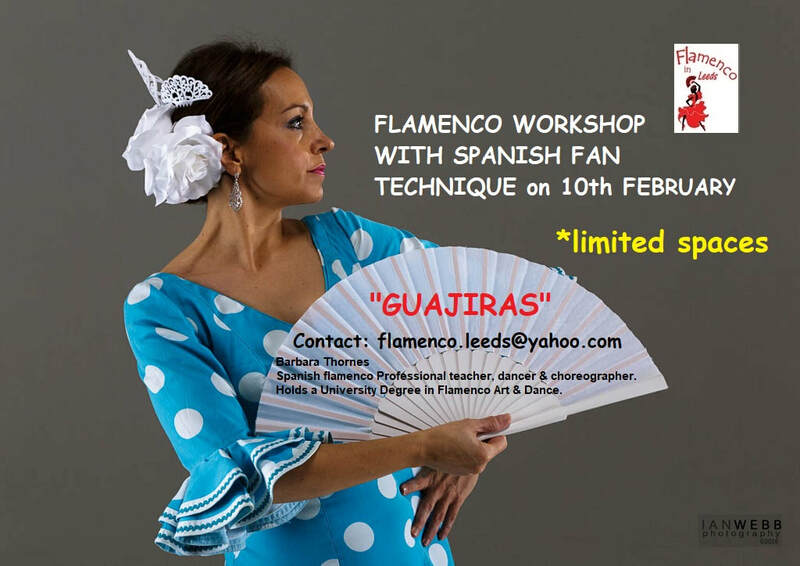 Venue: "The dance Studio Leeds"
Spanish flamenco professional teacher, dancer & Choreographer. Holds a University Degree in Flamenco Art & Dance. LIMITED SPACES, you need to do the reserve now if you don't miss out. OLE! Get ready to explore the Flamenco Roots and it’s amazing art, feel the body expression and the magical and stunning movement of the flamenco shawl, Flamenco technique. A unique and exciting experience to learn the technique of flamenco shawl. I will introduce you to the world of flamenco, you will learn the management and technique of the flamenco shawl and also I will teach you “Alegrias from Cadiz”, its timings, movements and expression of the whole body. We will work together in a choreography to dance a Alegrias from Cadiz with the flamenco shawl. Alegrías originated in Cádiz. Alegrías belongs to the group of palos called Cantiñas . The livelier speeds are chosen for dancing, while quieter rhythms are preferred for the song alone. The word Alegrías literally means "joys. *Recommended wear hard-soled shoes, comfortable & loose clothing wide skirt if possible for the ladies and a shawl (if you haven't a shawl please let me know and I will lend you one). *Bring water and a smile! It is a pleasure to announce that this year our dance school Flamenco in Leeds will form part of the great Flamenco Festival in Leeds on 26th of May 2018. Also so excited to be invited to teach and prepare Bulerias for the finale of the Flamenco Festival, for this reason I will do two special workshops on 12th and 19th May 2018, we will be accompanied with guitarist. It is to a chance for everyone to be involved whether you are performing or not. I will introduce you to the world of flamenco dancing, you will learn "Bulerias", it's timings, movements, and expression of the whole body. We will work together in a choreography to dance Bulerias. A great opportunity to work with musician as well! *There are LIMITED SPACES, please make sure you book now and don't miss out! * Recommended wear hard-soled shoes & comfortable & loose clothing wide skirt if possible for the ladies. * Bring water and a smile!